The patient was a 59 y/o male who presented with an abdominal mass and was found to have a 7.0 cm mass in his ileum. The resected specimen showed a well-circumscribed mass without hemorrhage or necrosis. 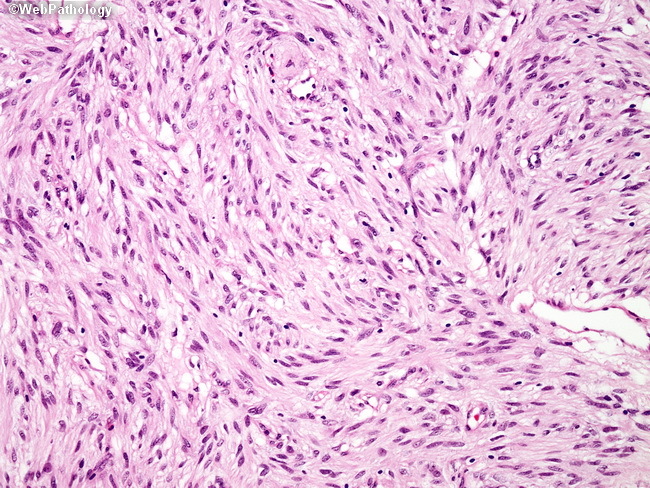 The tumor consists of relatively bland cells arranged in short intersecting fascicles. Immunohistochemical stains for CD117 and SMA were strongly positive, where as S-100 was negative.